Bibek Acharya Tribhuvan University, Institute of Agriculture and Animal Sciences. Ram kumar Shrestha Tribhuvan University, Institute of Agriculture and Animal Sciences. Keywords: AUDPC, disease severity, Downy mildew, Onion, Stemphylium blight. Field trial was conducted on horticultural farm of Lamjung Agriculture Campus, Lamjung, Nepal between December-April 2016/17 on onion (Allium cepa), following two factorial Randomized Block Design with three replications and fifteen treatments to assess disease severity of Stemphylium blight (Stemphylium vesicarium) and Downy mildew (Peronospora destructor). The onion cultivar Red Creole, widely grown in this locality and susceptible to these diseases was used for trial. The disease intensity for Stemphylium leaf blight and Downy mildew was rated on weekly basis. Disease severity of both the disease significantly varied with nitrogen level and irrigation interval during initial and middle growth stage of onion, but in contrary, was found non-significant during later days as the plant approached harvesting stage. Area under Disease Progress Curve (AUDPC) also significantly varied in both treatments for both disease. Yield parameters recorded viz. bulb diameter and bulb yield significantly varied with nitrogen level and irrigation interval. 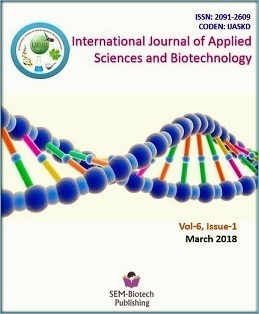 The interaction effect of both the treatment was found non-significant for disease severity, AUDPC level and yield parameters during entire growth stage of onion. The results indicated that 7 days irrigation interval and government recommended dose of nitrogen i.e. 235 kg/ha were significantly better over other level of treatments in reducing Stemphylium blight and Downy mildew disease severity and also increasing yield parameters. Bibek Acharya, Tribhuvan University, Institute of Agriculture and Animal Sciences. Bachelors degree Completed from Institute of Agriculture and Anmal Sciences. Ram kumar Shrestha, Tribhuvan University, Institute of Agriculture and Animal Sciences.